The Fisher Scientific AccuSpin 8C Centrifuge is a compact powerhouse, with a unique hybrid dual spin rotor. This benchtop centrifuge features the 2 in 1 hybrid rotor that can swap between fixed angle and swinging buckets without needing to change the rotor itself. This centrifuge can accommodate 1.4 ml to 15 ml blood tubes, gel tubes 10 ml syringes, and 15ml conical tubes without issue. 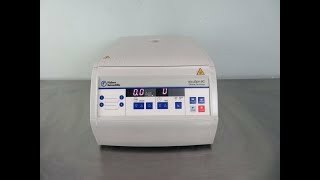 The Fisher Scientific AccuSpin 8C Centrifuge has a brightly lit, easy to read frontal display, from which users can select from 3 different deceleration profiles or one of the 4 user defined programs stored in memory. This microprocessor controlled benchtop centrifuge is quiet operating so you can keep it close by and features one touch lid closure for simple operation. The Accupsin 8C has a maximum speed or 4900 RPM, and max RCF of 3114 x g, and a timer up to 99 minutes, with a hold function. ThisThermo/Fisher Accuspin has been throughly inspected and reached its max speed without issue. All of our lab equipment comes backed with our standard warranty. Should you have any questions, please don't hesitate to contact us.